We climbed up the side of a hill, and it was hot. Rock tombs this time, not tumuli like the ones we had seen at Tarquinia. Then, in the Etruscan necropolis near Pitigliano, we came upon the temple front carved out of tufa, columns only stumps sticking out of the ground, but marking unmistakably what we might assume to be a classical temple façade. Two thousand years ago the rough volcanic stone would have been painted in what we might call gaudy colours, an imposing statement to all who contemplated it from far or near. Our experience was different. It appeared unexpectedly from behind holm oaks. We were in Petra last March; there the temples too were cut out of porous stone, pink but, like the rougher tufa, easily worn away by storms, flash floods or winter rains. It didn’t end there. Further round the hill were many more rock tombs, one with a sculpture of a fabulous female goddess still in its original place. She looked familiar. Legs splayed, perhaps ending in fins, or claws – the extremities were worn off – looked like something I had seen recently. Where had I seen her before? These tombs dated from the sixth or fifth centuries BC. 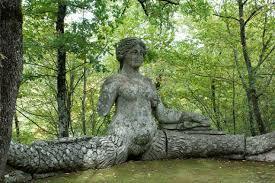 Ah, that strange figure that intrigued me in the so-called ‘Garden of Monsters’ at Bomarzo, created north of Rome in the sixteenth century AD. Separated by about 2000 years. 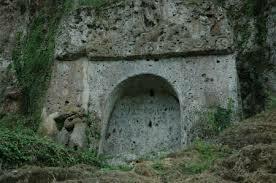 But I thought the Etruscans were virtually unknown until William Dempster wrote about them in the late 17th century. His manuscript survives at Holkham Hall, Norfolk, and is now on display in an excellent exhibition in the Etruscan Museum in Cortona, Tuscany, the first such museum in the world. Unfortunately the picture I took of the Etruscan goddess is too dark to see inside the niche, nor is she on the internet, so she remains mysterious, so I can only illustrate a similar niche tomb from the same area. The Romans conquered the Etruscans. Some early Roman emperors – the Tarquins – were Etruscan, but this didn’t inspire the Roman historians to find out more about this sophisticated people who, like the Greeks, were organised into a fedceration of city states. Instead they were crushed through absorption, intermarriage and battles. Perhaps this historical character assassination happened because the Romans adopted many Etruscan practices, but above all, no written record survives, apart from temple inscriptions also written in Latin and some stones with accounts, to tell us about them. They must have had legends, poetry, an epic account of their history – nothing has come down to us. This is probably because it was sung by itinerant storytellers, like the ones you can still hear in Indian temples, and never written down. That bust of Homer with the furrowed brow and ragged beard is probably a product of European historical imagination and willpower. He might have been the last of the storytellers before the Odyssey and Iliad were written down, or the historical combination of numerous ones. So the Romans incorporated Greek traditions into their own national story, and the European one. 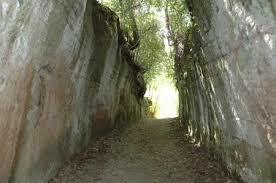 Somewhere along the line the Etruscan were side-lined, absorbed after the Roman victories in the 3rd century BC. Some of the most magnificent painted tombs at Tarquinia were only discovered in the 1960s and 1970s when at last the Etruscans were separated from the Romans and studied for what they were – a sophisticated mercantile community that emerged in the 10th century BC and went on to exploit the abundant mineral resources of their homeland to create great works of art and the mysterious ‘carved’ roads where you can still make out the marks of the axes, presumably of slaves. Tufa is a soft stone, but the later Roman roads were laid on top of the earth surface. Why did the Etruscans cut into it so dramatically? Nobody seems to know.